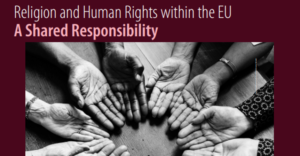 On 4 December, the European Parliament organized an event entitled Dialogue seminar with churches and religious communities: Religion and Human Rights within the EU – A shared responsibility. The event was organized in the framework of the European Parliament’s dialogue with churches and non-confessional organization under Article 17 of the Treaty on the European Union. It was chaired by Mairead McGuiness, Vice-president of the European Parliament in charge of this dialogue. The event was composed of two panels: the first one focused on “Evaluating the EU’s Framework for defending human rights in the EU” while the second one was dedicated to “Human Rights challenges and solutions in the EU”. Humanists advocate for secularism as it is the only democratic principle that provides a framework for the effective realization of human rights. By separating the state from religious organizations and by committing it to full neutrality, secularism ensures that everyone is treated on equal footing. Secularism therefore is by definition a necessary condition for the implementation of fundamental freedoms. Among the speakers, Michael O’Flaherty, Director of the EU’s Fundamental Rights Agency emphasized that when it comes to human rights, the role of churches is often seen from a negative angle although many positive contributions to the implementation of human rights by faith-based communities exist. He called on efforts to increase religious literacy in public debate in order to better grasp the role of churches and religion in this domain. Birgit van Hout, Regional Representative for the Office of the UN High Commissioner for Human Rights reminded the audience, among other elements, that Human Rights cannot be subjected to religious norms. Virginie Rozière, French MEP and co-chair of the European Parliament Platform for Secularism in Politics acknowledged the role that religious organisations play in the implementation of certain human rights. She however also mentioned many others where the role of many religious organizations is detrimental. She reminded the audience about the issues encountered in the ratification of the Council of Europe Convention on preventing and combating violence against women and domestic violence, also known as the Istanbul convention. She mentioned for instance that in Slovakia, religious groups openly campaign against the convention spreading lies about its content and trying to impose a traditionalist vision of society stemming from religious dogma. Giulio Ercolessi, President of the European Humanist Federation confirmed the analysis of MEP Rozière. He praised religious organizations for having made a long way since much darker times where most of their actions and doctrines were in full contradiction with human rights. He however also warned about continued positions and practices of many churches, including the Catholic Church, that directly undermine and threaten a number of other human rights. These particularly concern the health and safety of women and LGBTI people, end of life dignity and indoctrination at young age. He also called on EU institutions to show the same determination in standing up for Bangladeshi humanist bloggers stabbed to death by Islamist groups or jailed for “blasphemy offence” as for rightfully helping Asia Bibi (a Pakistani Christian woman sentenced to death for ‘Blasphemy’ and threatened by Islamists) and her relatives to find asylum in Europe. The EHF is glad that such a debate took place in an event that was initially organized only with religious organizations. Despite the many areas where certain churches are at odds with basic human rights, we rejoice at the contribution they make in putting certain other ones in practice. We however have to assert firmly that standing for human rights is by no means only a religious virtue. We feel compelled to remind that there cannot be any hierarchy between human rights, that Freedom of Religion or Belief does not supersede any other human rights. This is why humanists advocate for secularism as it is the only democratic principle that provides a framework for the effective realization of human rights. By separating the state from religious organizations and by committing the state to full neutrality, secularism ensures that everyone is treated on equal footing. Therefore, secularism is by definition a necessary (but not sufficient) condition for the implementation of fundamental freedoms. Άρθρα - Articles, Ευρωπαϊκό Κοινοβούλιο - European Parliament, Θρησκευτική ελευθερία - Religious freedomΕΝΩ.ΟΥΜ.Ε./H.U.G. - E.H.F. - I.H.E.U.